Step 1 Core the peppers and cut them into lengthwise strips no thicker than one-eighth inch and about 2 1/2 inches long. Place the sliced pepper in a large bowl. Step 2 Slice the kernels off the corn, and toss them with the peppers. Step 3In a small bowl, whisk together the lemon juice, zest, garlic, olive oil, agave syrup, salt and chipotle powder to form a dressing. Taste and adjust to taste. Step 4Pour the dressing over the peppers and toss well to coat completely. Stir in the cilantro and toss until evenly combined. This makes about 6 cups slaw. Step 5Cover and refrigerate the pepper slaw at least 1 hour before serving. The slaw will keep for up to 2 days, refrigerated. In Recipes-list.com we have selected the most viewed recipes from category - Best recipes Salads Vegetarian . Enjoy the best recipes specially selected for you! 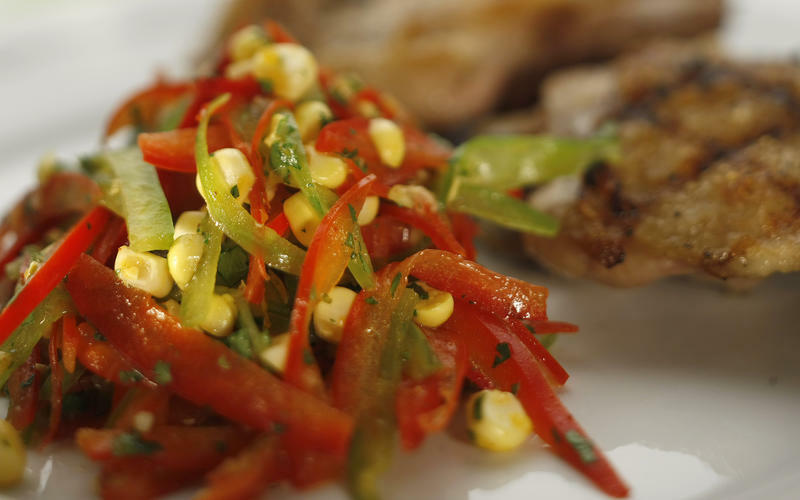 Bell pepper and corn slaw is the right choice that will satisfy all your claims.